Apple just announced iPad Air, the fifth in its line of (nearly) 10-inch tablets. Last year, Apple's big-boy got a perfunctory upgrade, but this year the iPad's getting a new super skinny design—and a new name—with batch of significant improvements that'll carry it through the next year. Here's what you need to know. The rumors about an iPad redesign were true, but it's even slicker than we thought. The iPad Air features the first really significant update to the tablet's hardware since the iPad 3, which added a retina display and an increase in heft due to a hulking battery. At 7.5mm thick, the iPad Air is 20 percent thinner than its 9.5mm predecessor, with a flat-backed design resembling the iPad Mini. Very handsome. It's also way lighter, just one pound, compared to 1.44 pounds before. Apple says it's the lightest full-size tablet in the world. That should help it stand out from the pack. Early accounts suggest the new tablet is a delight. The iPad's 9.7-inch screen size and 2,048 × 1,536 resolution remain unchanged. It'll be available in silver and space gray. Inside, the iPad Air runs the same burly new A7 system chip the powers the iPhone 5s. According to Apple, the new chip doubles the iPad Air's graphics and computational performance compared to the 4th gen model. Compared to the original, that's eight times faster CPU performance and 72 times faster graphics. The new chip, as we noted before, introduces support for 64-bit architecture. Basically, Apple's future proofing its ecosystem for devices with more than 4GB of RAM. Additionally, the CPU features an underlying improvement in architecture (ARMv8 from ARMv7, if you must know), which should greatly improve battery life. The A7's new M7 Motion Coprocessor, which manages inputs from the iPads built-in sensors. Although, we're less sure what we'd use this extra power for given that you're less likely to go for a run with iPad in tow. And last but not least, the iPad Air has Wi-Fi with MIMO that's two times faster than before and dual built-in microphones that'll help improve the audio quality. The iPad camera has always lagged behind the camera on the iPhone, and it won't catch up with the iPad Air—not in resolution at least; it's still just 5 megapixels. The 1.2 megapixel 720p FaceTime camera has been upgraded to a camera that can shoot in FullHD 1920 x 1080 resolution, though. As we noted before, the iPad 3 was big 'un because it needed a big battery to power that beautiful retina display. Now that the iPad is a a skinny slate, the concern would be that battery life might suffer if Apple used a smaller battery. According to Phil Schiller the iPad Air will get 10 hours, just like before. Impressive. Apple will now offer colorful Smart Cases that enclose the whole iPad. This'll be nice for people who port their tablet around a lot. They'll cost $80. 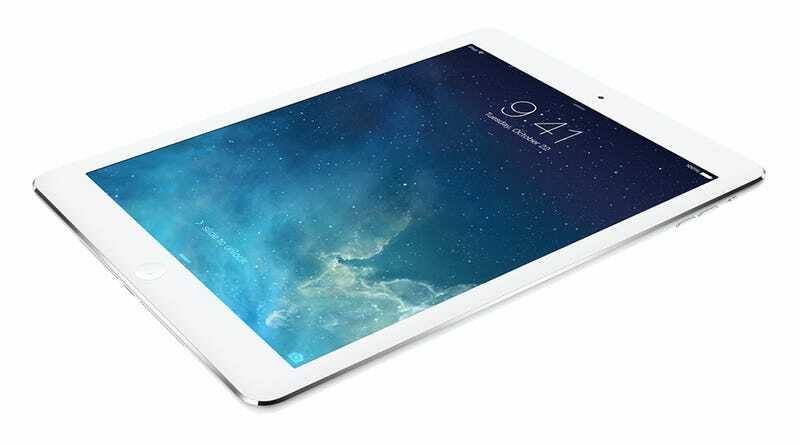 iPad Air will hit stores on November 1st. No pre-orders this time. 16/32/64/128 GB Wi-Fi models should cost $500, $600, $700, and $800. LTE models should cost $630, $730, $830, and $930. Additionally, the iPad 2 will remain in the line starting at $400, which is really expensive for an ancient tablet.